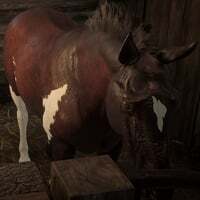 Tennessee Walker is a Horse Breed in Red Dead Redemption 2 (RDR2). Horses are special creatures used as transport with different performance based on breed, and players can also Bond with them for enhanced features. Tennessee Walkers are riding horses. They can be identified by their refined head and elegant build. The Red Room, Black Rabicano and Dapple Bay costs can be found in the wild. A Flaxen Roan is purchasable from a stable. This breed is renowned for its eye-catching trot and comfortable gait. They are healthy and handle well, with good Stamina and Speed, making them perfect for long journeys. Tenessee Walker breed of horses are renowned for their elegant looks and smooth riding making them perfect for long journeys. This breed is renowned for its eye-catching trot and comfortable gait. They are healthy and handle well, with good Stamina and Speed, making them perfect for long journeys. You can find the Tennessee Walker horse at ? ?